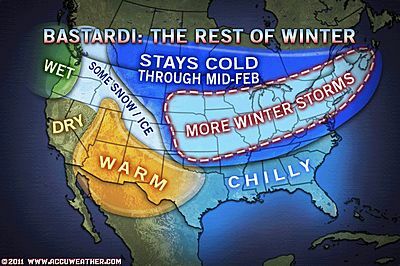 Accuweather's Joe Bastardi provides this map for the continental US with narrative here. He doesn't really talk about our part of the country except to suggest some spring snow storms. It looks like friends in New Mexico can expect more good falconry weather. Nice job- post a forecast like this and then we get some snow, rain, and a some real cold (worth it for the snow) even down in Southern NM- nothing like giving Mother Nature a chance to show up the weatherman.